Firstly I?d like to start by thanking all the people that left messages & emails informing me of what they had for tea that night after my last message. Much appreciated. I had a burger and chips for lunch today, my first hot meal bought over the counter for about 1.5 months. It ruled. Anyway, lets talk Iceland. What I liked most is that it is totally unique compared to all the other countries I?ve visited so far. Someone?s traing to sell me something I don?t want while I sweat a river - must be Asia. Cobblestone streets and windy little alleys - Copenhagen, Stockholm, Bergen, take your pick. For those who don?t know Iceland is in a fairly active volcanic and seismic area, so it has all the stuff that comes with that combined with all the goodies that come with a country that close to the poles. Geysers, hot springs, stinky sulfur and hot tubs. Check. Massive glaciers and fjords. Check. Surreal barren landscapes covered in black rocks and rubble. Check. Massive black gravel glacial outwash deltas. Check. Amazing waterfalls due to funky rock features. Check. I?ll let the photos do the rest of the talking, cause words aren?t good enough for a country like this. I will give a shoutout to J?sa, where a glacier extends all the way to the ocean. 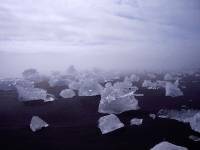 Chunks of ice continually break off into a lagoon and float out to sea. The place is shrouded in mist where the ice meets the warmer ocean water and seals roam the lagoon looking for fish. Then theres the people. Being left on a little island up in the cold has formed a unique culture. Bj?is the rule not the exception. From the guy who didn?t like the sun cause it made it too hot and gave us dried fish and chocolate wafer biscuits (to try traditional Icelandic food) to the eclectically dressed locals that hang out on Reykjavic to the scowling, skinny, straight haired teenage girls that inhabit the smaller towns, theres a bit of everything in everyone here. And lets not forget those into witchcraft and sorcery who tell the stories of trolls and elves who inhabit the countryside. Or as they say, thesmal people who live in the lava that are so beautiful and wear such beautiful clothes that they are invisible to us. On that note I?ll leave it on this. Iceland rules. Go there.